Wondering what to do after school? Really wanting a snack but there's nothing in the cupboard you want? I got home from school today and I had this problem. So I took a look in the cupboards and found some ingredients. I enjoy baking and now I'm older I can do it by myself (without Mum taking over!) except for the oven, I have to have an adult then. I knew that the old fashioned method for making buns was "4, 4, 4 and 2" But I needed to find out of what. A quick chat with Mum and I was ready. Firstly I needed Mum to put the oven on for me, she set it at 160C (we have a fan oven) and then I laid the cupcake cases in the tray ready and put this out of the way. Then I added ALL the ingredients into a mixing bowl and mixed really well with a wooden spoon. I didn't know how this would taste but I felt like trying it. I then scooped the mixture into the cases, Emily helped (she loves baking too! She helped with a few other bits too.) And then with Mum's help I put them in the oven.They would take about 10-15 minutes to cook. Then with Mum's help again, I took them out and left them to cool. They were really nice! The toffee sauce worked well, they had a yummy taste. I shared them out after dinner for dessert and everyone enjoyed them. We recently took a short break in Cardiff and whilst there we stayed at the beautiful Cardiff Bay. Cardiff Bay looks stunning in the evening glow. Image from Google images. Situated here there is a fantastic centre called Techniquest. It was within walking distance from our hotel but is very easily accessible from the City Centre too. 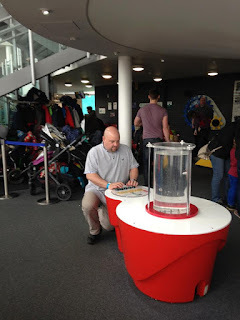 Techniquest was founded in 1986, moving to its current location in 1995 and they aim to encourage people to enjoy and become more involved in science and learning. If you're travelling by car, the postcode is CF10 5BW. Leave the M4 at junction 33 and follow the brown signs for Cardiff Bay. There is pay and display parking right next to the centre. Ticket prices are very reasonable especially as they give all day re-entry, plus they have a special offer on throughout 2016 giving entry for just £3 per person after 2pm on Sundays!!! They are open daily with some changes on Bank Holidays and School Holidays. 9.30am–4.30pm Tuesday–Friday; 10.00am–5.00pm Saturday and Sunday. They are closed on Mondays during school term time, but open on Bank Holiday Mondays, and on Mondays during local school holidays. The centre also caters for educational visits with different Key Stages in mind and birthday parties. Here Mollie shares our visit and her thoughts. 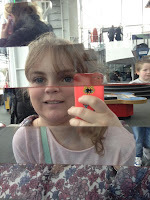 We went on holiday to Cardiff to see where our Grandpa came from and Mum and Dad took us to Techniquest. The building was huge and looked a bit like a train station on the outside! We went inside and there was a short queue to pay, They gave us wrist bands to wear which meant we could go in and out all day. Dad also booked us in for the "Bubbles and Blasts" show. 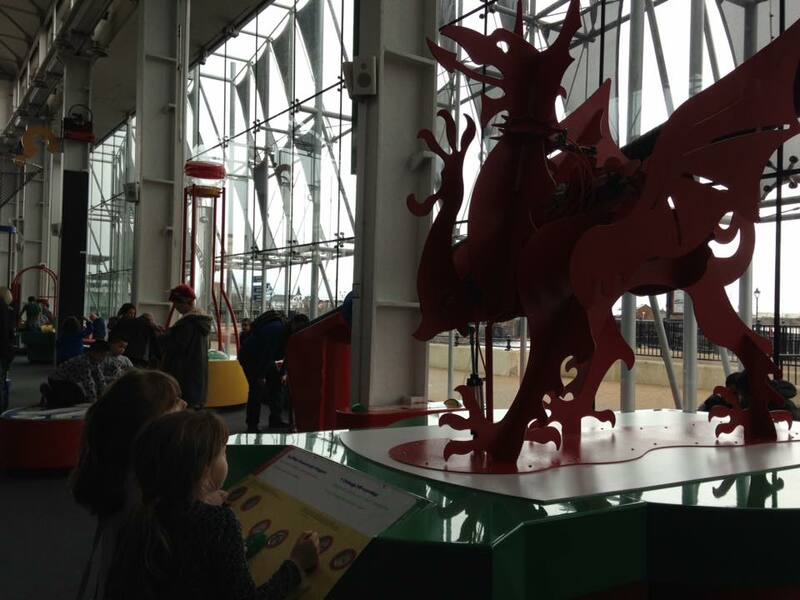 The first thing we came to was a giant red dragon which we could operate using buttons and levers. The dragon was the same one that is on the Welsh flag which was cool. There were loads of fun things to do which involved different science or technology parts. 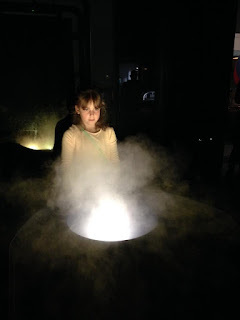 There was a dark zone which had a shadow wall, different light activities, and a cool smokey cauldron! 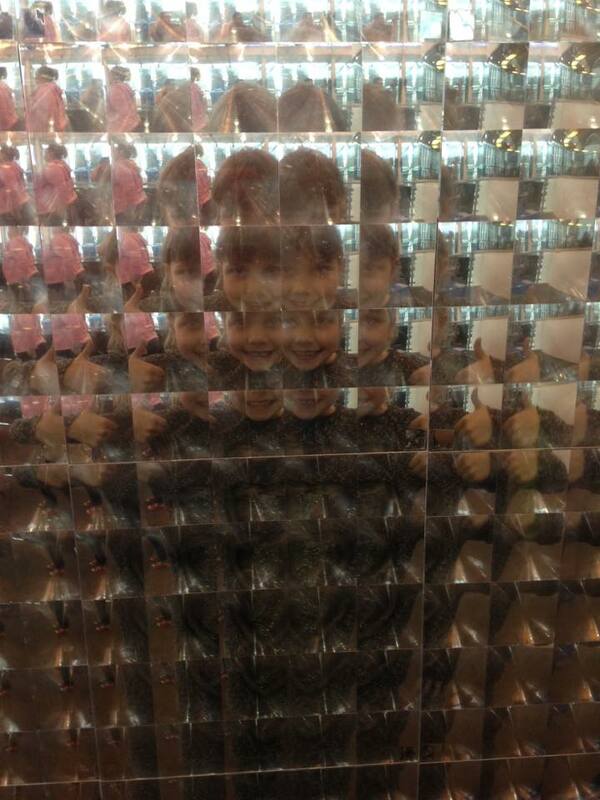 There were some optical illusion walls, the selfie below is actually a mix of mum's face and mine. I think we look weird. The other photo is Emily through a fly's eye - ERGH! Dad got really involved trying to make the perfect whirlpool in the cylinder. He spent ages getting it going. Oh and there was this massive iron pendulum, it was chained from the ceiling and you couldn't get next to it to touch it but you had to throw magnets from two sides until they stuck to it, when they were both on you could pull them really gently and make it swing. You had to work together with someone else and get the timing right and it was really hard to do but Dad was a bit of an expert! 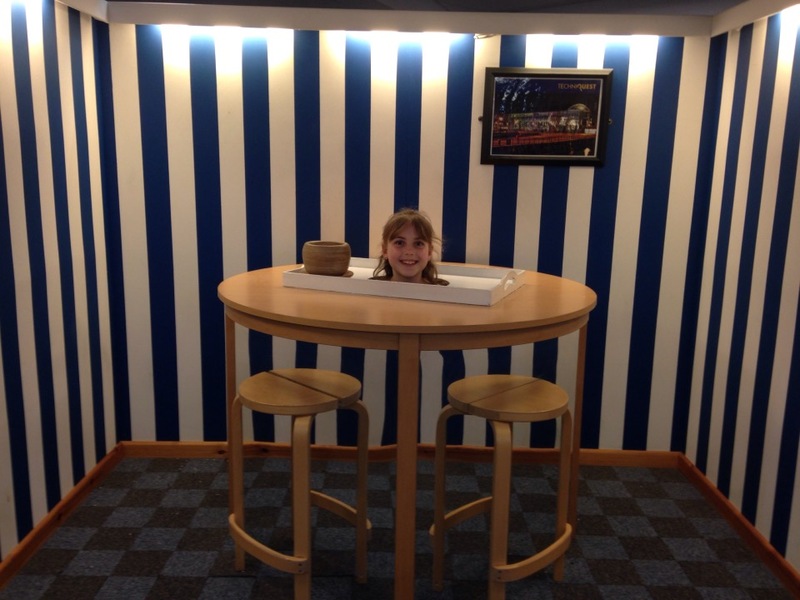 At the back of the downstairs was a water zone where you could experiment with different ways water could work things. And there was a game which you shot water jets into different things; like a washing machine, car wash, bath and a toilet. You could see how much water would be needed to work these things. There were some aprons but not many but we just had to be careful not to soak ourselves! Upstairs there were more fun things to do and some more optical illusions which I really liked. 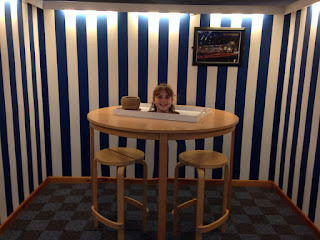 There was this one where you crawled in a hole at the back and when you stuck your head up it looked like your head was sitting on a table but your body wasn't there. Soon it was time for our "Bubbles and Blasts" show, we queued up near the entrance and were taken through to a small theatre, with rows of seats in a semi-circle. We sat on the front row, about in the middle. There were two presenters and they showed us different bubbles and ways to make them, they were quite interesting as they told us how bubbles are made up too. They filled balloons with explosive gases too which was fun, we all had to cover our ears! The show lasted about 15 minutes and was really funny. Dad told them to try smokey bubbles another time. There was a cafe at Techniquest but we didn't go in there as we had already had lunch and were going out for dinner afterwards but it looked nice. And there was a gift shop which sold lots of things from pencils and magnets and things like wooden toys and science sets. So, what did I think of Techniquest? 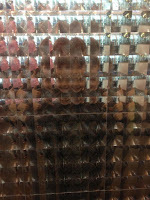 I think it was fun and exciting and I would love to go there again! My favourite activity was this thing were you had to pull a rope which lifted a heavy weight, when you dropped it it pushed air through a tube and shot a tennis ball up high into the air and then it would fall back down into a net. A couple of times we saw people who managed to get the tennis ball to fly out of the net too and we kept trying but never managed it. 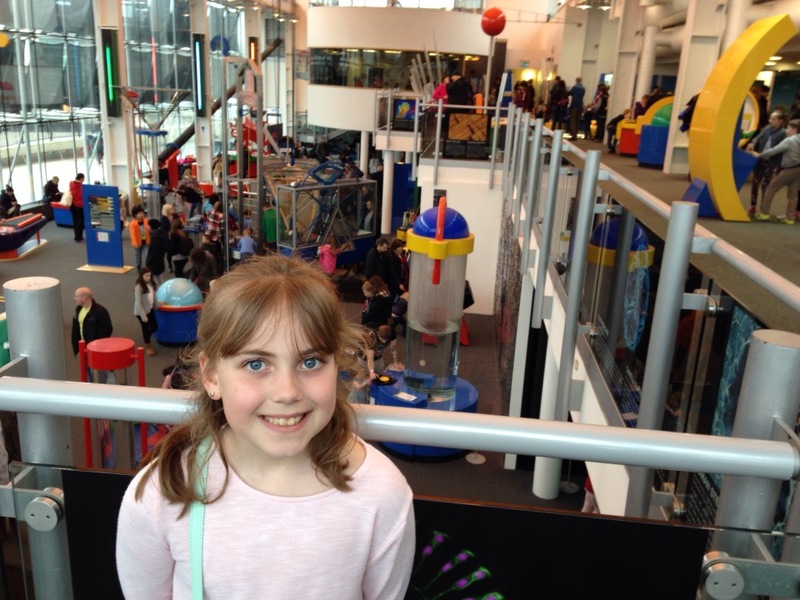 So definitely go to Techniquest if you are visiting Cardiff its great! 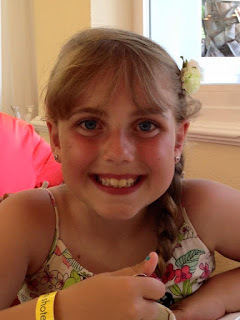 Hope you enjoyed my first blog!